5th sentence, 74th page: Number Two was that, Mr. Vossen having left earlier than usual the previous evening, we didn’t know definitely whether Elli had been able to get hold of the key, and had perhaps forgotten to shut the door. Discovered in the attic in which she spent the last years of her life, Anne Frank’s remarkable diary has since become a world classic – a powerful reminder of the horrors of war and an eloquent testament to the human spirit. In 1942, with Nazis occupying Holland, a thirteen-year-old Jewish girl and her family fled their home in Amsterdam and went into hiding. For the next two years, until their whereabouts were betrayed to the Gestapo, they and another family lived cloistered in the “Secret Annexe” of an old building. Cut off from the outside world, they faced hunger, boredom, the constant cruelties of living in confined quarters, and the ever-present threat of discovery and death. This book was both impossible to put down, and heart-wrenching to pick up. Not because it was overly sad, but the knowledge of Anne’s death throughout was haunting. There is so much hope and optimism, even in her darkest moments that it is hard to realise that she doesn’t have that happily ever after. Although, I suppose that is why we read non-fiction – there isn’t the happily ever after for everyone, just a very real and very tragic ending. 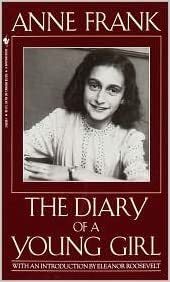 What haunts me the most about The Diary of a Young Girl is how similar Anne Frank is. A lot of what she writes in her diary is exactly what I would have written as a stubborn, opinionated teenager. The holocaust and World War II have never really been moments in history that I can relate to. After all, I’ve lived an incredibly privileged and happy life. So reading the words of a young girl who was going through exactly the same things as me, and hearing my own voice reaching out over the passage of time… it was just… haunting. There is no other word for it.